Tag line: "Plan your escape this Summer"
Fifteen years after his Escape from New York, everyone’s favorite anti-hero, Snake Plissken (Kurt Russell), is back on the job, taking his talents to the West Coast to once again save the world from devastation. The trouble began when Utopia (A.J. Langer), daughter of the ultra-conservative President of the United States (Cliff Robertson), stole the aiming device for “The Sword of Damocles”, a satellite weapon that, when triggered, emits an EMP pulse that kills all power (electrical and battery) in the target area. She then delivered the device to her boyfriend, a revolutionary named Cuervo Jones (Georges Corraface), who had been exiled to L.A. See, ever since the near-cataclysmic earthquake of 2000 broke it away from the mainland, Los Angeles has served as the world’s largest prison colony, where only the worst derelicts and lowlifes are sent. Enter Snake Plissken, who, after getting into a bit of trouble in Cleveland, has been sentenced to live out his remaining days in L.A. Remembering what he did in New York, the authorities offer Snake a deal: retrieve the aiming device, and he’ll be granted a full pardon. Of course, there’s a catch: to ensure he stays on task, Snake has been infected with a deadly virus that, in 10 hours, will shut down his entire system. When he returns with the device, he’ll be given the antidote. Can he get the job done in time, or is this the end of Snake Plissken? Escape from L.A. is nothing new; it adheres fairly closely to the formula laid out in Escape from New York. What’s more, the special effects are dodgy at best (a late scene, where Snake “surfs” a tsunami, is particularly tough to watch). But if it’s high-octane thrills you’re after, then this is the movie for you. From the moment Snake lands in L.A., the action is non-stop, with plenty of shoot-outs and a handful of cool chase scenes (one of the more intense sequences actually takes place on a basketball court). Along with the excitement, Escape from L.A. has a pretty awesome cast, including Pam Grier (playing a man posing as a woman), Bruce Campbell (as a plastic surgeon from hell), Steve Buscemi (Map to the Stars Eddie), and Peter Fonda (as a surfer looking for the ultimate wave). Then, of course, there’s Kurt Russell as Snake Plissken, the king of bad-asses. Watching the actor step back into the role that made him an action star is easily the film’s best feature, and he handles the part, physical demands and all, with the greatest of ease. 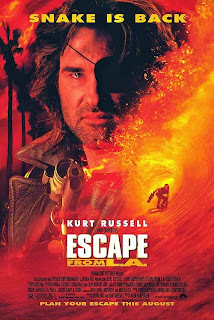 Escape from L.A. is a solid enough action flick, but without Kurt Russell, it would have fallen flat on its face.